Brief Synopsis – A young inner city school teacher trying to figure out what he wants in life has things become more complicated when a student finds out that he is using drugs to get by. My Take on it – This is a film that I saw years ago and recalled the stellar performance by Ryan Gosling but nothing beyond that. 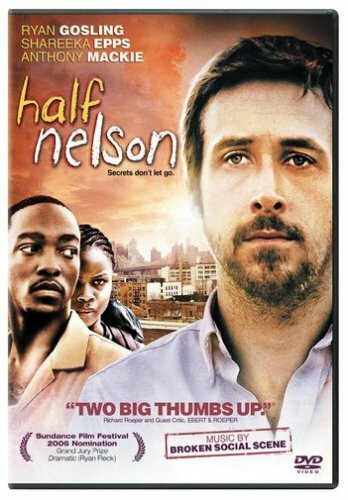 This film is another example of a film that is able to create a great central character performed exceptionally well yet the environment that he finds himself in and the situations presented just don’t come across as being completely genuine and believable. Gosling is able to play this role in a way that the character seems in control in certain circumstances yet in others seems totally lost. The story is hard to actually take at face value which hurts the believability of it all. The teacher-student connection presented here is a bit strange and this actually hurts the film since it constantly blurs the line between what should be a normal teacher-student relationship since in this case, we constantly learn over and again that we cannot trust either of the characters to act in the role that they are presented to us in. The scenes that are the most powerful in the film are the ones that show Gosling in the classroom since he is able to show how much potential his character has to shape young minds and the charisma that he represents throughout shines through in those scenes. Unfortunately, when he is outside of the classroom, we can easily see how lost his soul truly is. The dichotomy presented here makes things much more difficult to take a t face value and since we are never truly quite sure which of his two personalities is the true one and that makes it so much harder to trust anything he says or does. Bottom Line – Gosling is superb in this role and manages to show a character who in some situations looks as if he is in total control yet in others, totally lost along the way. Unfortunately, the storyline of the film is the weak link because it doesn’t manage to make us believe everything that is happening because of the way things play out. The connection between teacher and student is a bit strange and also hurts the film to the extent that it blurs the fine line between the teacher-student relationship when we see that neither can really be relied upon to do what they are expected to do here. The scenes that show Gosling teaching show how much potential and charisma his character has but when we see his outside of the classroom, he is just as lost as anyone can truly be. This dichotomy makes it so that we are never quite sure which of his two personalities is the real one and therefore which of the two should we trust is the actual character.